Hard to believe tomorrow is a new year already. This one flew by. I started the year researching adopting as a single and praying about whether God was saying yes or no or wait. No clear yes or no for most of the year so I waited and kept on praying. In July, I led a team of 24 to Uganda & Ethiopia and on the second half of our journey - we visited an orphanage and my life was changed in a moment. I got my answer. The moment I picked up a sweet little boy and he laid his head on my shoulder, hugged tight and made himself at home in my arms. I chose him but he chose me first it seems. What a little snuggle bug. My heart melted in an instant. I wish I could show you a photo my teammate Ashley took at that precise moment when he snuggled in and I closed my eyes and soaked up the moment. It is my most favorite photo and it's so neat that it was taken that very first moment we met. I will treasure it forever. Someday I'll share it with y'all - once it's ok to post his pictures. I've spent the entire week off painting. 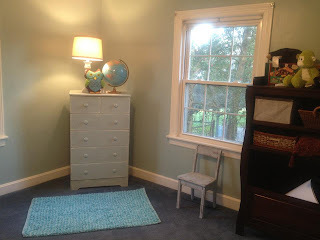 I painted a living room dark brown and I painted my little guys room a blueish color called Misty Surf. I LOVE it. It's so cheery and yet peaceful. I cannot wait until his little feet walk on these floors and his little smile lights up these rooms. I can't wait till I get to wrap him up in his new hooded bath towels that my co-worker and friend Merrill made for him. I can't wait to tuck him into his bed and read him stories in the rocking chair that I will soon have. I can't wait to show him on the globe I got for his room where mommy came all the way across the ocean to find him. I can't wait to be the one who takes care of him and makes sure he's loved and well fed and healthy. I can't wait to be the one who kisses him goodnight and tells him how loved he is. I can't wait for all of it. I can't wait till he's home. I'm praying that 2012 will be the year that I bring him home. I'm hoping and praying by summer but of course, the timing is not in my control or I'd already have him here. I hope and pray that this Christmas was my last Christmas without him here and I'm so looking forward to next Christmas together as a family. As I head into 2012, I'm hoping, praying, believing I'll have my son home soon. I just hit $17,000 raised toward this adoption so far - that is just mind blowing. The Lord has been opening doors and putting it on hearts and so many people have given so generously to this adoption. Thank you, thank you! On behalf of me and my little boy - THANK YOU. And may God bless you in 2012 in so many ways! LOVE! Happy New Year. I hope he is soon here too!!! He has a GREAT blessing in the mom he has... someone who already loves him well! So glad to have met you and thankful to be on the journey with you. Praying that he is in your arms at home soon!